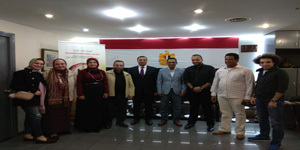 Under the auspices of the Student Activities Department, the faculty of Arts and Design arranged a seminar on the 3rd International Conference on Advances in Education and Social Sciences (ADVED) held in Istanbul – Turkey from 6/10/2017 to 14/10/2017 as well as the subsequent exhibition mounted by the Egyptian Consulate in Turkey. The conference was attended by Dr. Nahla Ahmed Hamdy El – Deeb, an Associate Professor in the Fashion Department and Dr. Nermeen Mahmoud Goma, a Lecturer in the Painting Department who both submitted research papers in the conference. The seminar was held on Tuesday 24/10/2017. During the seminar, Prof. Nahla Ahmed Hamdy El – Deeb gave the students a synopsis of her research paper that was entitled as ” The significance of Kinetic Art in Visual Art and Its Applications in Designing Textile Models “. Then, Dr. Nermeen Mahmoud Goma provided the faculty students with a summary of her research that discussed ” The Development of Glass Mosaic Murals through Ages and Its Relation to Architecture: An Artistic Analytic Study”. At the end of the seminar, students had discussions with professors about the research papers submitted in the conference.